It has been ages since I made something that I posted on my blog. I had lots of tags and quick cards for the end of school/graduation flurry of activity, but they went out of the door the minute I finished them. It's good to be back in my creative space. This is my take on this week's Muse Challenge for which Jen Wills of JENerally Speaking is the Muse! I love Jen's style. Her card inspired me to do a beach-themed creation as well. The angle at which I took the photo makes it seem like the pieces of the chairs don't match up, but when you look at the card head on, they do. Thanks so much for stopping by today. Cardstock: SU Tempting Turquoise, Crumb Cake, Gina K Pure Luxury White. Stamps: Gina K By The Sea 2. Inks: (VersaFine Vintage Sepia) Tsukineko, Memento Tuxedo Black, Ranger Distress Inks - Salty Ocean and Tea Dye, Versa Mark. Accessories: WOW Bay Area Blue Embossing Powder, Twine, Starfish Charm, Dimensionals, Cuttlebug EF, PTI Double Ended Banners and Tag Sale #4 Dies, Nestabilities Circle Dies, large sponge daubers. 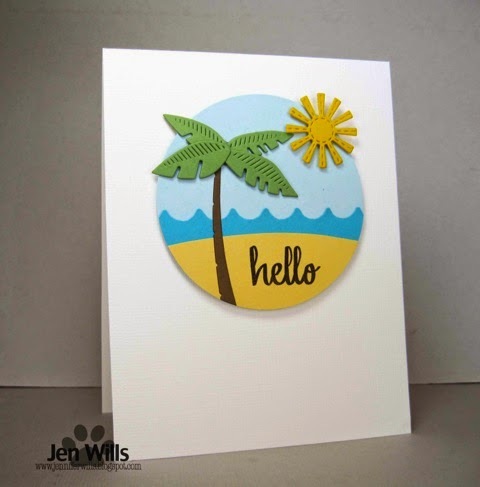 Love how you've interpreted Jen's Muse card - that precision stamping is amazing - they look like they match to me! Thanks for joining us! What a beautiful card!! Love the embossed background and the scene...perfect!! This just looks like a beautiful life! So wonderful. Hello Stephanie, you bet me to the punch. I was typing my comment for your card. I totally love your card. The colors are awesome, the embossing is flawless, the stamped images are great, the die cut is perfect and the sentiment is just right. Love it. You have my vote. This is such a fabulous card! Your stamping is amazing, I love how you created your scene, and your embossed background is perfect!! !